Tower boss - tower structures that spawn randomly at different locations while traveling the world Minecraft. In each tower there is a problem as a monster, you must defeat him to get a good catch. And what are the monsters? 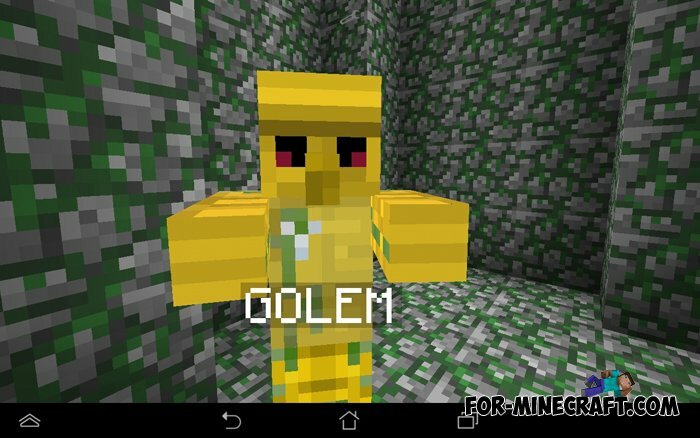 Monster - it is yellow and terrible golem. Golem - type of monster that appears in medieval literature. They are said to be made of dead materials, such as clay and stone. They move slowly and awkwardly, but can cause very strong blows. Golem has about 100 heart health, so you definitely need to prepare before entering the tower boss in an attempt to kill him. If you manage to destroy the golem, you'll get some interesting things out of it, for example, a block of gold. Note: For correct operation mode you will need to have an internet connection at any time, as the mod uses the textures loaded with Imgur.